Safely and easily deliver power from your portable generator to your homes electrical panel during a power outage with a Generac manual transfer switch. Once installed, our manual transfer switch eliminates the need to run multiple extension cords through open windows and doors and allows you to safely power hard-wired items like your furnace or well-pump. Outdoor model R501210 is designed for 12 circuits, 50 Amps and generators up to 12,500 Watts. The NEMA 3R rated aluminum enclosure can be surface mounted outdoors next to an existing load center, and a 50 Amp 4-wire locking male inlet (CS6365) is provided for fast plug-in generator connection. Power up essentials like lights, refrigerator, furnace (gas or oil only), television, kitchen circuits, well pump, sump pump, water heater, garage door opener, security system and electric range. Includes three 15 Amp 1-pole breakers, three 20 Amp 1-pole breakers, one 20 Amp 2-pole breaker, one 30 Amp 2-pole breaker and one 50 Amp 2-pole breaker. Easy to use. UL Listed in USA and Canada. 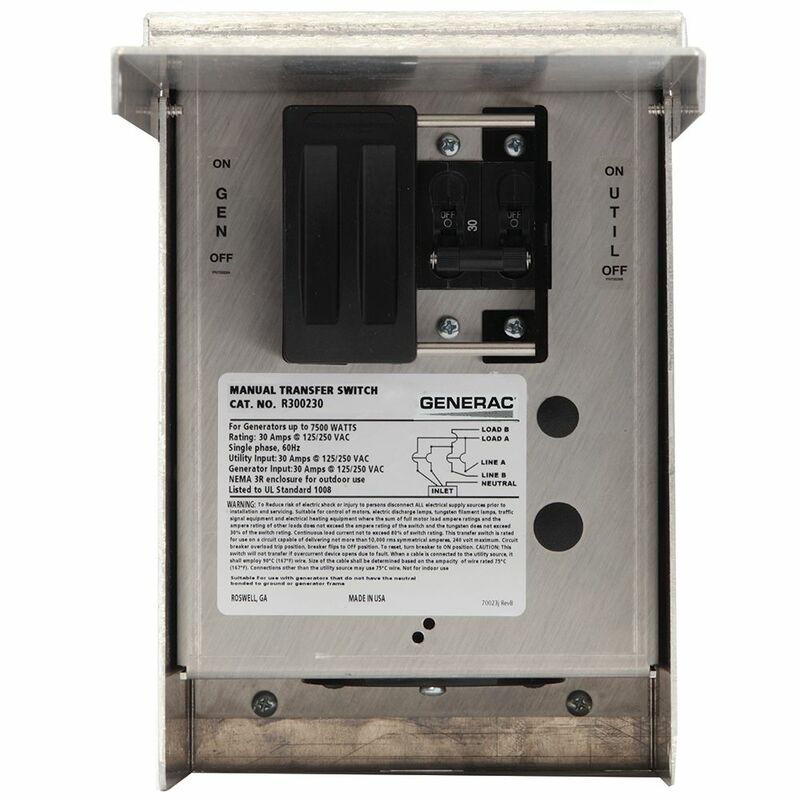 Generac Automatic Transfer Switches are designed for use with single phase generators that utilize an Evolution or Nexus Controller. Through the use of digital power technology (DPM), these switches have the capability to manage up to 4 individual HVAC (24 VAC controlled) loads with no additional hardware. 30 Amp 125/250-Volt 7,500-Watt 1-Circuit Manual Transfer Switch Safely and easily deliver power from your portable generator to your homes electrical panel during a power outage with a Generac manual transfer switch. Once installed, our manual transfer switch eliminates the need to run multiple extension cords through open windows and doors and allows you to safely power hard-wired items like your furnace or well-pump. 30 Amp 125/250-Volt 7,500-Watt 1-Circuit Manual Transfer Switch is rated 4.3 out of 5 by 7. Rated 4 out of 5 by Spectacular from This transfer switch is good for a single circuit which draws a lot of amps like a well pump or a... This transfer switch is good for a single circuit which draws a lot of amps like a well pump or a eOne Sewer grinder. IE: double pole 30 amp circuit. I installed this switch myself as the homeowner and it was more involved than I anticipated, but was well within my scope of ability. Challenges: 1. It's barely prewired-Wires are only 6" long and require you to purchase all additional wiring separate vs. other brand transfer switches which come already prewired. 10 gauge needed. 2. All screw nuts from the factory holding the prewiring in place were loose. Make sure to double check the pre wiring nuts. 3. No electrical whip included. Overall, it works as designed however a prewired unit would have been much easier to work with. The instructions included are clear and easy to follow. Rated 5 out of 5 by Peeps from All in one disconnect. Plug and play. Perfect for my application. All in one disconnect. Plug and play. Perfect for my application. Rated 5 out of 5 by jb from perfect for what it is. Full 3 pole switching. Of course large in terms of size, but if this is ... perfect for what it is. Full 3 pole switching. Of course large in terms of size, but if this is what you need this is the best, cheapest and most readily available option. Rated 4 out of 5 by David from Good product at a good price.... Good product at a good price. Rated 3 out of 5 by dj611229 from Okay Not the best constructed product out there but okay for the cost. Rated 4 out of 5 by Robert from Overall a Good Product Product is solid and well built. The slide switch to ensure you are only on the generator or on the source line is plastic but is fairly thick. The instructions are simple and fairly clear. It's a little hard to get the front panel off and back onto the hinge like pins at the top of the metal box and as it turned out was one of the hardest parts of the project.